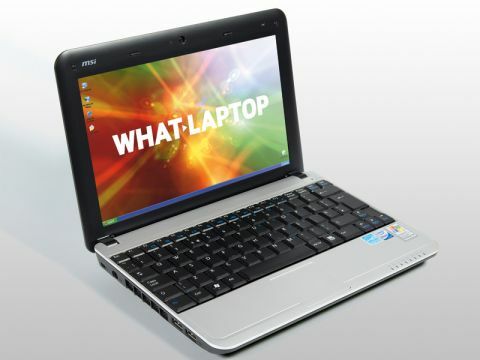 MSI's Wind netbooks have been well received and extensively rebranded by many manufacturers, including Medion and Advent. MSI now brings unique storage and outstanding mobility with its own-brand Wind U115 Hybrid. Since the original Wind design was so effective, little has changed here. The compact 1.3kg chassis is still highly portable and its rounded edges allow it to slip easily into small hand luggage. Where the U115 blows away the competition is its storage and battery life. Both an 8GB Solid State Drive (SSD) and a 160GB Hard Disk Drive (HDD) are fitted, the intention being to run your software from the faster SSD and store your data on the capacious HDD. When running on battery power, an easy-to-use hotkey combination lets you disable the HDD to get maximum mobility from the low-powered SSD. With a bulky 6-cell battery in place, we were able to work for a truly stunning 780-minutes - by far the best result we've ever seen from any netbook or laptop on the market. Build quality is good. The silver design helps the U115 stand out from the almost endless crowd of black netbooks, and the large fan on the chassis' left-hand side helps it stay cool at all times. Usability is also fantastic. The large keyboard moves with a firm yet smooth action. Some punctuation keys have been made smaller to make room for the main keys, but it's not really a problem. The tiny touchpad is less usable, however. The stunning 10-inch TFT screen is extremely bright and easy to use in all conditions. Its matt finish eliminates reflections and, although colour and contrast lack vibrancy, it is still one of the better netbook screens we've seen. With its unique storage and exceptional mobility, the Wind U115 Hybrid is one of the best netbooks around. Its high-price is off-putting though, so carefully consider your needs and budget.